Taipei, March 20 (CNA) Sweden's new representative to Taiwan Håkan Jevrell pledged Monday to increase his country's profile in Taiwan to encourage more Taiwanese investment and vice versa, as he sees great potential for the two sides to cooperate in various areas. Jevrell, who took up the post in September 2018, said that most Taiwanese are familiar with many Swedish international brands, such as Spotify, Ericsson, Saab, H&M and IKEA. 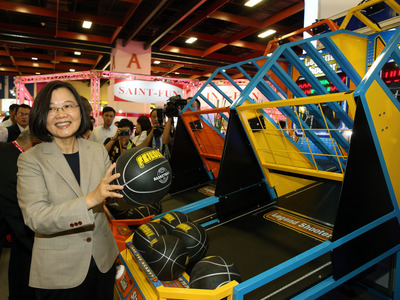 But such familiarity does not guarantee Taiwanese investment, he noted. "Most Taiwanese people know things about Sweden. But when it comes to actually going there for investment and for business opportunities or tourism, I think it (Sweden) is a little bit underperforming," he said. There is still much room for improvement in terms of Sweden's visibility in Taiwan other than these international brands, he said, adding that that is what his office is working on. The envoy said that Taiwan and Sweden have much to work on, pointing out that Sweden ranked second in the world on the World Index of Innovative Countries last year. According to the index, Stockholm, the Swedish capital, is second only to Silicon Valley in the U.S. when it comes to the number of "unicorns" -- billion-dollar tech companies -- that it produces per capita. In the same vein, he admitted that it is somewhat frustrating to note that Taiwan is not on the radar for most Swedes, as when they look at the Asian market, they see only two major economies -- China and India. "But I think it is extremely important to look on other markets outside those two big ones to diversity and identify great potential," he said. He noted that his office has to do more to explain the strength of Taiwan to the Swedish decision makers, which is also one of his main tasks in Taipei. According to statistics, Sweden ranked 38th among Taiwan's trading partners worldwide in 2018, with two-way trade amounting to around US$1.2 billion in that year. Also, there are currently some 260 Swedish students studying in Taiwan, according to statistics compiled by the Ministry of Education. Jevrell said that, in addition, there are about 250 Swedish nationals living in the country on a long-term basis, excluding those who hold dual nationality. Jevrell said he sees great potential for Sweden-Taiwan cooperation, especially in the age of digitalization. The match between the two economies is good, as Sweden has a very broad industry base including in the areas of biotech and medical tech and Taiwan is known for its strong technology development. With the Stockholm-based Ericsson, a world leader in telecommunications technology, including 5G, and connected services, that makes the two sides "a perfect match," he added. Having been in Taipei for only around 6 months, the 50-year-old chief of the Swedish Trade and Invest Council, which represents Swedish interests in Taiwan in the absence of formal diplomatic ties, said he has been impressed with what he has seen so far in Taiwan. Taipei marks his second post in Asia, having just concluded his first overseas assignment as Sweden's ambassador to Singapore. Coming from a different path compared to a traditional diplomat, Jevrell was raised in a military family in which his grandfather, father and two brothers served in Sweden's navy. After serving in the Swedish navy himself, Jevrell worked as a prosecutor before being named state secretary -- the number two official in the nation's Ministry of Defense -- a post he held for five years. Six months after assuming office, he said he has had some chances to travel around the island, most recently over Christmas, when he, his wife and two children visited Kenting in southern Taiwan. As an ice hockey lover, the envoy said he is also happy to find a local ice-hockey league in Taipei that he recently joined for practice and games, allowing him to continue to play the sport he has loved since childhood. His team recently also played against the Taiwan women's national team and he is deeply impressed by their skills.